The Consumer Product Safety Commission (CPSC) issued a regulation for Christmas lights on Monday, deeming some holiday decorations a "substantial product hazard." "The Consumer Product Safety Commission … is issuing a final rule to specify that seasonal and decorative lighting products that do not contain any one of three readily observable characteristics (minimum wire size, sufficient strain relief, or overcurrent protection), as addressed in a voluntary standard, are deemed a substantial product hazard under the Consumer Product Safety Act ("CPSA")," the final rule said. The ruling applies to a variety of Christmas decorations, including "stars, wreathes, candles without shades, light sculptures, blow-molded (plastic) figures, and animated figures." However, "solar-powered products" are exempt. 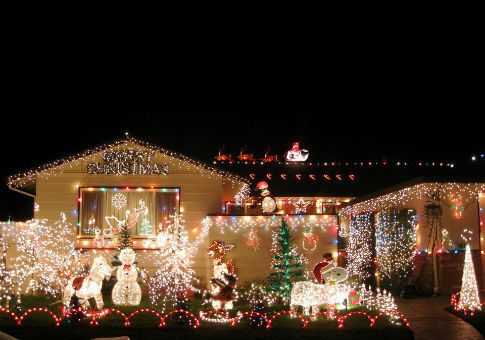 The CPSC said the regulation is necessary because Christmas lights can be dangerous. "A lighting string provided with decorative covers over the lamps is a decorative outfit," the final rule said. "If not constructed properly, lighting powered by 120 volts can be damaged easily and can pose a risk of electrical shock or fire." The CPSC said there have been 258 deaths associated with Christmas lights between 1980 and 2013. However, fatal incidents have been on the decline, with an average of less than one fatal (0.9) incident a year since 2008. The number of people who die of alcohol poisoning in California every year is greater than the number of Americans who have been killed by Christmas lights in the past three decades. The CPSC has a detailed definition of what constitutes a Christmas bulb. "Lighting products within the scope of the rule are typically used seasonally and provide only decorative lamination," the final rule said. "The products typically are displayed for a relatively short period of time and are then removed and stored until needed again." "[Underwriters Laboratories ("UL"), Standard for Safety for Seasonal and Holiday Decorative Products, UL 588, 18th Edition] UL 588 section 2.43 defines the term ‘seasonal (holiday) product’ as: ‘[a] product painted in colors to suggest a holiday theme or a snow covering, a figure in a holiday costume, or any decoration associated with a holiday or particular season of the year,’" it explained. The rule is listed as a "voluntary standard." However, manufacturers and retailers can face civil and "possibly criminal penalties" for failing to report any products to the CPSC that do not meet the regulation’s requirements. This entry was posted in Issues and tagged Regulation. Bookmark the permalink.